A Color Sergeant with his regimental flag partly unfurled to the breeze, with eagerness written in every line of his manly face and lithe body, with hand on the sword at his side, ready to spring forward at the command to lead his comrades anywhere and everywhere they are ordered to go, well typifies the hero color-bearer of the One Hundred and Twenty-fifth Infantry who lost his life in this battle on the very spot marked by this grand monument. This statue is a portrait statue of Color Sergeant George A. Simpson and well illustrates the possibility of securing in enduring granite, faithful portraiture and detail of uniform and accoutrement. Stanley Edwards was selected as the artist to execute this portrait statue. The pedestal supporting this statue is built of four stones, two bases, die and cap. Rough quarry faced effects are shown in its composition and very happily combined, with a touch here and there of fine hammered surfaces. This command was also of the Twelfth Corps and therefore the band of five pointed stars cut on the upper portion of the die stone is not only very appropriate, but very ornamental. A large five-pointed star, occupying the entire face of the left hand face of the die is also cut into the surface of the granite. 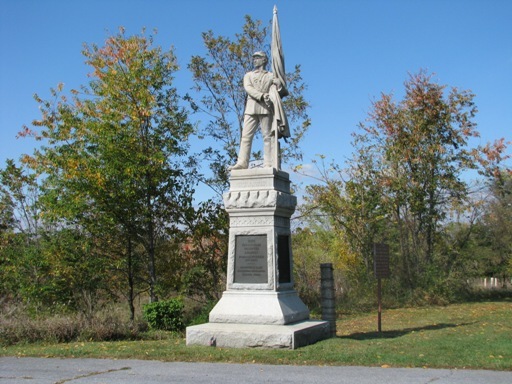 The cap stone has a battlement effect on its rough surfaces, suggestive of the ancient battle towers, that is very rugged and dignified, and on the front face of the plinth stone may be seen the record of the death of Color Sergeant George A. Simpson of this regiment. The square of the lower base is 6 feet, the height 9 feet, the total height, including staff of colors, 19' 4". Recruited in Blair, Huntingdon and Cambria Counties, Penna. Moved at early dawn from bivouac on farm of George Line to East Woods near point where Gen. J.K.F. Mansfield was mortally wounded, from there to support Monroe's First Rhode Island Battery on Smoketown Road, then to woods that stood here September 17, 1862, was the first Union Regiment. Therein being far advanced and without sufficient support, it was outflanked by the enemy and retired behind batteries in field in rear and subsequently saved the guns of Monroe's Battery from capture. Remained in line until close of battle. Monument is near the left of its main line of battle. It was near this spot that the Regiment within Six Weeks after leaving home took an active part in this great battle. Organized at Harrisburg August, 1862. Left State for Washington, D.C., August 16, and duty in the Defenses of that city until September 6. March to Rockville, Md., September 6, and attached to 1st Brigade, 1st Division, 12th Army Corps, Army of the Potomac, to October, 1862. 2nd Brigade, 1st Division, 12th Army Corps: to January, 1863. 2nd Brigade, 2nd Division, 12th Army Corps, to May, 1863. Maryland Campaign September 6-24, 1862. Battle of Antietam, Md., September 16-17 (Reserve). March to Pleasant Valley September 19-20. At Maryland Heights until October 30. At Loudon Heights until November 8. Reconnaissance up the Shenandoah Valley November 8-19. Near Harper's Ferry until December 10. March to Fredericksburg, Va., December 10-15; thence to Fairfax Station. Burnside's 2nd Campaign, "Mud March," January 20-24, 1863. At Stafford Court House, Va., until April 27. Chancellorsville Campaign April 27-May 6. Battle of Chancellorsville May 1-5. Mustered out May 18, 1863. Regiment lost during service 2 Officers and 48 Enlisted men killed and mortally wounded and 1 Officer and 39 Enlisted men by disease. Total 90. Companies A, B, D, E, G, and K, were recruited in Blair county, and C, F, H, and I, in Huntingdon county. A few of the officers had served in the Mexican war, and a large proportion of officers and men in the three months' service. Receiving arms and accoutrements, the regiment moved, on the evening of the day of its organization, for Washington, reporting upon its arrival to General Casey, by whom it was assigned to a provisional brigade, of which Colonel Higgins was placed in command. On the 18th, the regiment was ordered into Virginia, reporting to General Whipple, and was stationed, first at Hunter's Chapel, and subsequently at Fort Bernard, where it was engaged in drill, and in fatigue duty upon the fortifications. In addition to regular infantry drill, five selected companies were detailed for daily artillery drills at the forts. During the closing scenes of Pope's disastrous campaign, it was on duty here, and until the 6th of September, when it was ordered to re-cross the Potomac, and proceed to Rockville, where, upon its arrival, it was assigned to Crawford's Brigade, of Williams' Division, of Banks', subsequently Mansfield's Corps, composed of the Tenth Maine, Fifth Connecticut, Twenty-eighth New York, Forty-sixth, One Hundred and Twenty-fourth, One Hundred and Twenty-fifth, and One Hundred and Twenty-eight Pennsylvania regiments. The march was resumed on the 9th, and on the 16th the corps arrived on the banks of the Antietam Creek, the battle opening on the afternoon of that day. At eight o'clock in the evening, the corps was put in motion, the One Hundred and Twenty-fifth, which was at the head of the column, being ordered to follow the lead of General Mansfield in person. Moving by as circuitous route, he crossed the stream and led his column to the support og tMe troops which had been engaged. Early on the following morning, Colonel Higgins was ordered to take his regiment across an open field to a small belt of timber, and drive out the enemy concealed therein. Advancing under a heavy fire of shot and shell, the wood was cleared, and pushing forward the enemy was driven to the little white church, on the Sharpsburg Road. General Mansfield, while at the head of his men, was mortally wounded, and was succeeded by General Williams. Soon afterwards, the regiment1 was ordered to advance into the woods, in which the church stood, and to hold the ground at all hazards. With heroic daring the regiment moved forward, and drove back the enemy, killing and capturing a number of his men. Being unsupported and in advance of the rest of the corps, it was finally forced to fall back before superior numbers moving upon its front and flank, and retired just in time to save itself from utter annihilation. The order to retire was reluctantly obeyed, the men being unaware of the movement upon their flank, and confident of their ability to hold their own against the foe on their front. It was soon after ordered to the assistance of a battery left without supports, and in imminent peril of capture. By its timely arrival the guns were saved, and repeated charges of the enemy to capture them and gain the position, were successfully repelled. WVhen iight at length put an end to the battle, the men sank upon the ground to rest, having displayed a heroism worthy of veterans. The slaughter in its ranks had been terrible. 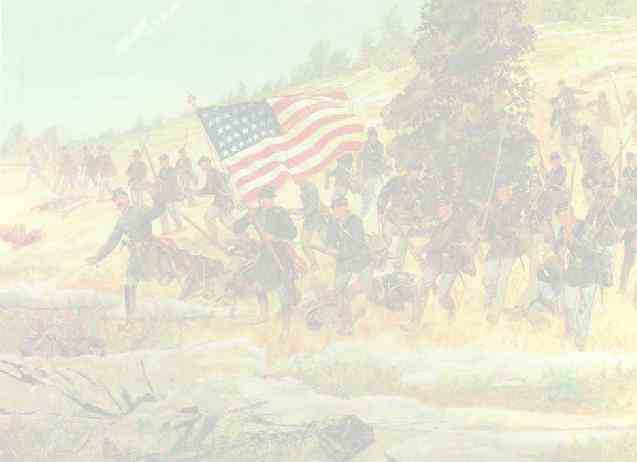 Five color-bearers were killed, and the flag was finally borne by Captain Wallace, of the color company. Lieutenant Colonel Szink was disabled by the explosion of a shell in the midst of the fight. Lieutenant Robert M. Johnston, Adjutant of the regiment, was mortally wounded, dying two days after. Captains C. R. Hostetter and William H Simpson, and Lieutenants Wilbur F. Martin, Alexander W. Marshall, Peter S. Trees, William C. Wagoner, and George Thomas, were among the wounded. The total loss in the regiment was twenty-nine killed, one hundred and seventeen wounded--four mortally, and four missing. After the battle, the regiment was posted at Maryland Heights, and in Pleasant Valley, until the 1st of November, when it crossed the Potomac and was stationed on the eastern slope of Louden Heights, halting, in the meantime, been transferred to the Second Brigade of the First Division, and been well drilled by regiment and brigade, the officers attending a school of instruction under the charge of Major Mathews, of the Forty-sixth Pennsylvania. On the 10th of December, the Twelfth Corps, which had been on duty in the neighborhood of Harper's Ferry, after the advance of the rest of the army into Virginia, commenced the march to join the main body, now moving for the battle of Fredericksburg. Passing Leesburg, and Fairfax, the regiment arrived on the 16th within four miles of Dumfries, while it was halted, the battle of Fredericksburg having terminated disastrously- and counter-marched to Fairfax Station, where it was finally settled in comfortable quarters. On the 27th, the rebel cavalry under Stuart made its appearance at Dumfries, and the brigade, on the morning of the 29th, was put upon the march to meet it. At Wolf Run Shoals its advance guard was attacked and a section of artillery was wheeled into position in an old rebel fortification, to await its coming. At evening, General Kane led the One Hundred and Twenty-fifth some six miles out, in advance of the brigade, to a crossroads, where it was placed in ambush, awaiting the appearance of the rebel raiders. The night was intensely cold and as it was necessary to maintain secrecy, fires were not allowed, the men undergoing intense suffering. The enemy failed to make his appearance, and finally escaped, and the regiment, on the following morning, returned to camp. 'Reached Dumfries the first night. January 21st. Rained all night. Left Dumfries early. Marched very slow. Bridge washed away. Halted to re-build it. January 22d. Rained all night. Left Shipping Point at noon, and marched three miles. Halted to build bridge across Acquia Creek. January 23d. Marched to Stafford Court House. January 24th. Visited by General Slocum, who complimented the brigade for its fortitude upon the march, and directed us to make ourselves comfortable in our present quarters." The campaign being now ended, time was here passed in drills and reviews, and in the performance of heavy guard and picket duty, the activity of the rebel cavalry in front occasioning frequent alarms and midnight marches. On the 24th of March the regiment was transferred to the Second Brigade, Second Division of the Twelfth Corps, composed of the Twenty-ninth, One Hundred and Ninth, One Hundred and Eleventh, One Hundred and Twenty-fourth, and One Hundred and Twenty-fifth Pennsylvania regiments, commanded by General Kane, and moved with it for duty to Acquia Creek Landing. At daybreak on the 27th of April, the regiment broke camp and moved on its final campaign, and after a rapid march, crossing the Rappahannock and Rapidan rivers, at Kelly's and Germania fords, arrived at Chancellorsville oil the evening of the 30th. On the morning of the 1st of May, the brigade advanced only the plank road leading east, and halted at a recently cleared ground. Knapsacks were thrown aside and line of battle formed, when the order to advance was given. At the edge of the pine woods through which it moved, the line was halted, and at the moment when Colonel Higgins and Major Lawrence were raising their field-glasses to view the wood beyond, the enemy opened with his artillery. Discovering that he was in the immediate front in heavy force, the brigade was shortly after withdrawn, and returned to the position which it had left. During the afternoon, the timber in front was felled and an abattis formed. Towards evening the enemy approached and opened fire, but was driven back, and during the whole night the men were kept busy throwing up earth-works, the enemy's skirmishers the while keeping up a sharp fire. At evening of the 2d, the right wing of the army was broken, and as the fugitives from the front came pouring back, the Twelfth Corps became the rallying point, and with it the rout was stayed. The night which succeeded was only of turmoil ant battle. At dawn the fighting was renewed with redoubled fury. Grape and canister were showered upon the ranks, and many fell, Lieutenant Jesse S. Stewart being numbered among the killed. At ten A. M., after having held the ground against the most desperate assaults, it fell back to the new line of battle, and during the night of the 4th was kept in motion to meet the exigencies of the fight. On the morning of the 5th, the regiment was ordered to the left of the line, where it was employed in constructing works, and where it remained until the morning ot the 6th, when it re-crossed the river and returned to Acquia Landing. Its term of service had now expired, and taking leave of camps and battle, it returned to Harrisburg, where, on the 18th, it was mustered out of service.